'S e seòrsa snaigean mòr a tha ann an crogall. 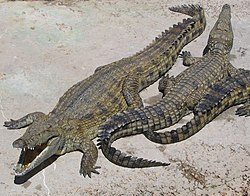 'S iomadh seòrsa ann agus tha iad uile anns an teaghlach "Crocodylidae". Tha alligators agus caimans san ordugh crocodilia (teaghlach Alligatoridae), agus an gharial (teaghlach Gavialidae). Air a tharraing à "https://gd.wikipedia.org/w/index.php?title=Crogall&oldid=521253"
Chaidh an duilleag seo a dheasachadh 27 dhen Lùnastal 2016 aig 13:31 turas mu dheireadh.